What paperwork do I need for new employees? Paperwork is a major part of the pre-boarding and on-boarding processes, and it can often cause confusion and stress for new hires and employers alike. This is because there’s a lot of important and sensitive information which needs to be both collected from and provided to your new employees. Pre-boarding paperwork is ideally completed before your new employee commences work, and includes all the legal and financial documentation required to define and formalise the relationship between you and your new employee. Onboarding paperwork includes employee orientation information, such as workplace policies and procedures, company handbooks, and information on any upcoming training. 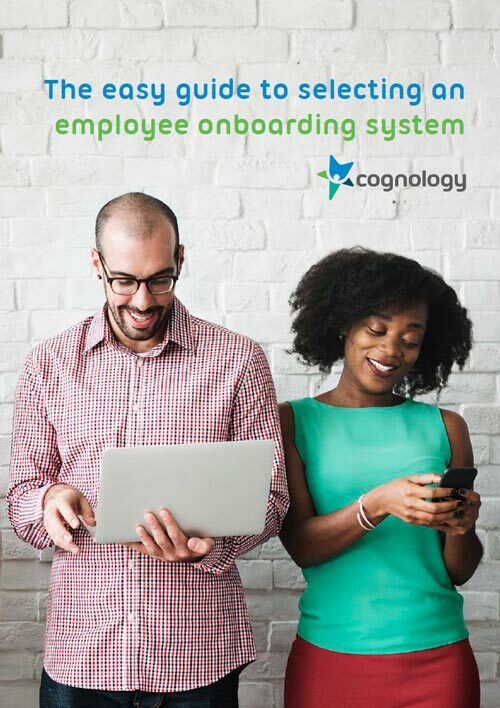 If you’d like to see how simple an automated an onboarding solution can be, download our Easy Guide to Selecting an Onboarding System today. Your new employee should provide their home address, postal address, personal phone numbers and email. In case of a workplace accident or illness involving your new employee, the name and contact details of their next of kin need to be on file. So that your new employee can receive their salary or wages, they need to provide you with details of the bank account they wish to be paid into. This is the agreement between you and your new employee, which sets out the terms and conditions of their employment. This should be kept in your personnel records, and you must also provide your new employee with a copy for their own records. The Australian Fair Work Ombudsman has a number of templates and guides you can use for creating your Employment Contracts. This clarifies the position title, required tasks and key responsibilities of your new employee. This information is best put into detailed writing to eliminate any miscommunication or misunderstandings between you and your new hire. You must provide new employees with a Standard Choice Form which outlines employee options for choosing a superannuation fund. You are required by law to provide new employees with a TFN Declaration Form. Details can be lodged online, but this form can also be ordered from the ATO. The form consists of 2 sections – Section A is to be filled out by the employee or ‘Payee,’ and Section B is for you, the ‘Payer’ to complete. Since 1 January 2010, all employers in Australia must provide new employees with a copy of the Fair Work Information Statement, which can be accessed online. This Statement gives your new employee a summary of their entitlements under the Fair Work Act of 2009 and provides them with contact details of Fair Work Australia. It’s also a good idea to provide your new employee with a copy of the relevant Award, which can also be on the Fair Work Australia website. The handbook should outline your organisation’s values and mission statement, history, and basic workplace information, as well as the conditions of employment, the expected employee behaviour and the workplace code of conduct. It should also welcome your new employee to the organisation and answer many of the questions they may have about their new workplace. To make sure your employee has a clear understanding of the workplace policies and procedures and their importance to your organisation, it is recommended that you provide them with their own copies of all internal policies. Policy areas relevant to employees include: information technology, social media and mobile phone usage, bullying and harassment, and occupational health and safety. There may be other forms of paperwork that are required in your jurisdiction, so be sure to check with your Human Resource or Employment Law professional to ensure you are meeting all your legal requirements as an employer. All this paperwork can certainly make things quite complicated, but fortunately most of the process can be automated or completed online with a simple onboarding solution. The Employment Contract and Agreement, Position Description, Employee Information, and Superannuation Standard Choice can all be provided as electronic forms and included in the automated pre-boarding process, whilst the TFN Declaration Form and Fair Work Information can be accessed and completed online. Your Internal Employee Handbook, Policies and Procedures, and all paperwork related to training and orientation can also be provided in electronic format and included in the automated on-boarding process. Automation is not only convenient, but it also adds a welcoming touch, because all digital paperwork will be personalised to your new employees. According to SHRM Foundation, new employees who take part in a well-structured on-boarding process are 69 percent more likely to stay with their new employer for at least three years. If you make the decision to automate your on-boarding process, you’ll also get notifications when your new employee receives and completes their paperwork. While we endeavour to cover all required paperwork in our above post, please ensure you check with a HR expert in your jurisdiction to make sure you are compliant with specific requirements for your location and industry.